Working with fine watches and selling fine diamonds has turned into a passion for Adam Aebischer. A fourth-generation jeweler, Aebischer loves working at his family’s jewelry store, Aebischer’s Jewelry in Poland, 68 S. Main St.
Aebischer, who grew up in Poland, quickly developed a love of all things mechanical. After hearing about his great- grandparents being Swiss watchmakers and their passion for mechanical watches, he realized this is where his drive to work with his hands and to fix anything mechanical came from. After graduating from Poland Seminary High School in 2007, Aebischer attended Youngstown State University in pursuit of a degree in mechanical engineering technology. During this time, he was also a salesman at a golf store in Boardman, Special Tee Golf. At Special Tee, Aebischer found he much he enjoyed helping people: whether it was fitting them with proper golf clubs or suggesting a different golf ball to use to accommodate their swing speed for better results. Two years into his studies at YSU, Aebischer decided that engineering was not the career for him. At the same time, he put his college education on hold and Special Tee Golf’s Boardman location was closing. This was his chance to get back to what he was truly passionate about – working with his hands. Aebischer approached his parents with the idea of coming to work for them to see if he enjoyed fixing things on a much smaller scale. He soon realized that working at Aebischer’s Jewelry was where he wanted to be. 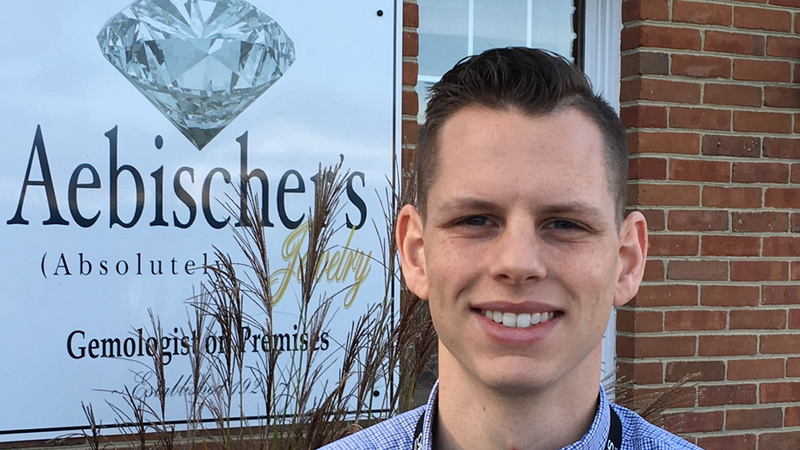 Aebischer decided to attend the New Approach School for Jewelers, where he earned a certification in basic bench repair work and gemstone setting. Still determined to earn a college degree, he decided to return to Youngstown State University and pursue a degree in business. In July 2015, Aebischer received a B.S. in business administration, a course of study he specifically chose to help run the family’s business. 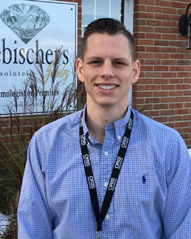 Aebischer’s next career goal is to become a graduate gemologist like his father. He is now through half his studies at the Gemological Institute of America. He specializes in watches and diamonds. “I love what I do because there is nothing better than working alongside my dad and being able to help educate customers,” he says. Aebischer resides in Poland with his wife, Jenna, and son, John. “You never know,” he says, “John could become the fifth generation at Aebischer’s Jewelry. Aebischer’s Jewelry was founded in 1928 by Swiss immigrants John and Johanna Aebischer. The couple came to the United States in 1927 while Johanna was expecting their first child. John had been working for 10 years in a Swiss watchmaking factory, where he had developed his skills as a fine watchmaker. Johanna also worked in a factory that made jewels for watches. Deciding to leave for America, John asked his boss to write a letter of recommendation so that he could hand it to a future employer. Once arriving in America, even though his tools were stolen and they could not speak a word of English, they traveled to Lowellville where they knew other Swiss families had settled. John worked for another jeweler for six months before deciding to find a small place to rent and set up shop. He found a location on Bridge Street in Struthers with a bay window and door facing what was then, a bustling main street on state Route 616. To get his first customers, he set up his watch bench in the bay window and took his own watch apart and re-assembled it, several times a day until finally someone came in and said, “I see you work on watches. Mine isn’t working correctly. Can you fix it?” So from those humble beginnings, in April 1928, John and Johanna started what today is a four-generation, full-service jewelry store. The business was turned over to their son, Harold, in 1967. The business remained in the same location for 48 years until May 1976, when it moved to its present location in the center of Poland Village in the Town One Square Plaza at 68 S. Main St.
A few years before moving to Poland, Harold’s son Doug came into the business, learning the watch and clock repair trade. Shortly thereafter, Doug earned his graduate gemologist degree from the Gemological Institute of America. Doug, along with his wife, Karen, have owned the store since 1996, when Harold retired. Their sons Adam and Alex are now active in the fourth-generation jewelry store. Adam joined the business in January of 2009 and Alex in January 2016.